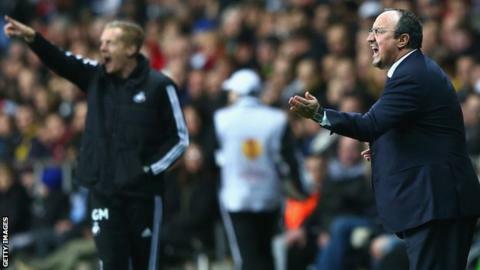 Napoli boss Rafa Benitez says Swansea head coach Garry Monk has a promising managerial career ahead of him. He led the Swans to a goalless draw against Benitez's Serie A side in the Europa League on Thursday, impressing the Spaniard. "From what I have seen, it seems like he has a good future as manager," said Benitez. "It was a great game and his side did well. If they carry on with similar things, it will give them good confidence." Monk, who had previously overseen three matches as Swansea boss, described the Napoli tie as the biggest test of his fledgling coaching career. The Serie A side missed out on qualifying for the knock-out stages of the Champions League only on goal difference before entering the Europa League and are among the tournament favourites. But the Welsh side dominated the first leg at the Liberty Stadium and were denied by a series of saves, first from Napoli goalkeeper Rafael and then his second-half replacement Pepe Reina, who is on loan from Liverpool. The two sides play the second leg in southern Italy on 27 February at the Stadio San Paolo. Former Liverpool boss Benitez, who won the competition with Chelsea last season, was happy with his side's first leg performance. "Playing against a team from the Premier League, we knew the rhythm would be different and that they played with a high tempo," said Benitez. "We suffered and we had to defend well, but I thought we played well. "It is positive to get a draw here. Swansea are fast, they played well and had good chances, but I think defensively my team did a great job against a side that attacked from start to finish. "It wasn't easy to stop them. Without being fully happy, I can be happy with the way we performed because it is difficult to defend against this tempo."